Students recently had an opportunity to do some secret Christmas shopping for family members. 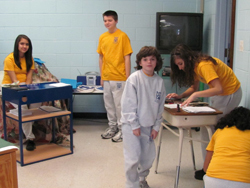 The Class of 2011 sponsored the annual ACS Christmas Shoppe. The class inventoried and set up for business on Tuesday, November 30th. 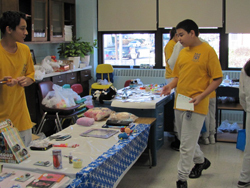 On Wednesday ACS students had the chance to browse and make wish lists for shopping on Thursday or Friday. It may seem like it was just shopping, but there were many lessons learned by the eighth grade and their assistants, the Class of 2012. 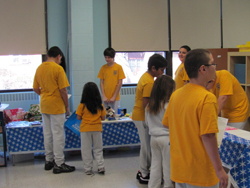 Inventorying items before and after the event helped students understand the need for accountability for a product. The seventh graders learned patience when working with kindergarten and first grade as shopping assistants. Customer interaction gave the older students a taste of what it means to deal with the public. The shoppers learned that sometimes their money did not cover their purchases and, without a parent there, they had to make big decisions about what to buy and what not to buy. The Classes of 2011 and 2012 worked hard and because of that the Shoppe was successful. Now all that needs to be done is to wait for Christmas to get here so that all of those purchases can be opened by all of the special people in the lives of our students.